Well, this is my 100th posting on this blog, I feel like I have only just started to cover all the material which is out there. I thank all of you for your support and your interest in this art form. 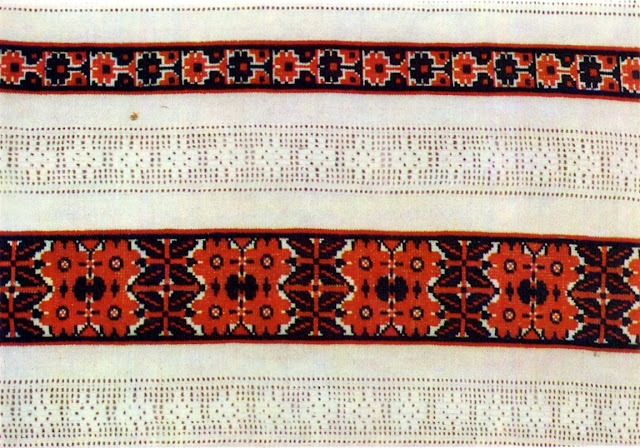 Today I will talk a bit about two particular forms of Ukrainian embroidery which are widespread especially in central Ukraine, Merezhka Poltavska and Obmana. 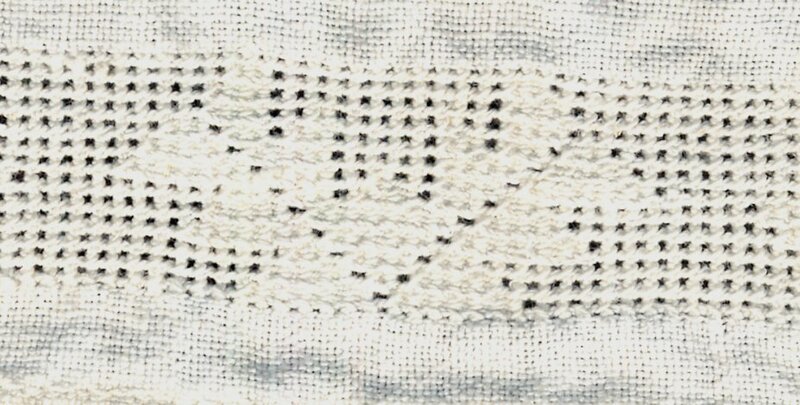 then stitching along the remaining gap, pulling the vertical threads into bundles, securing the edge, and forming a simple openwork design element. 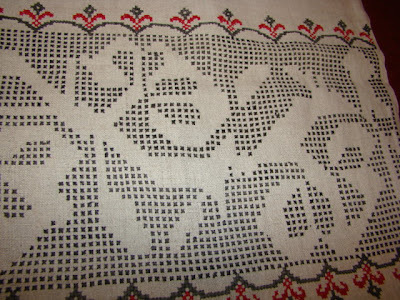 This technique in Ukrainian is called Prutyk. 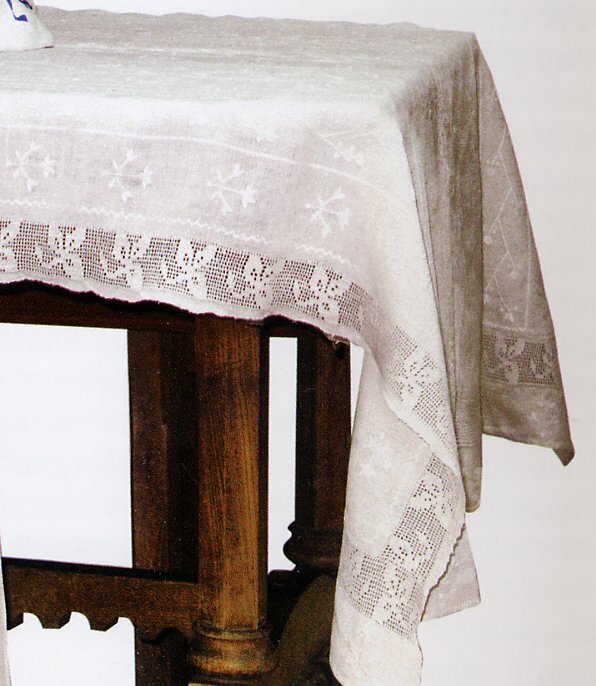 By using the pulled thread as a guide, one can then roll the edge of the cloth and sew a straight and attractive hem using this same technique, but catching the rolled hem on the bottom instead of the body of the cloth. This is why the technique is called hemstitching in English. This is often used in Ukrainian and other embroidery as part of a larger design, either as an accent or to break the cloth into different fields. 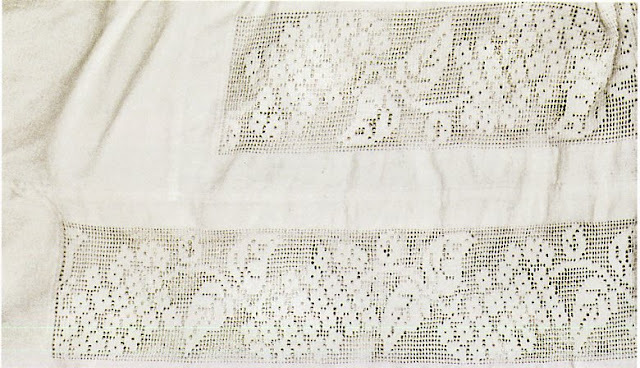 Usually when this is done, two or three threads are removed, the ends are bound to secure them, and both the top and the bottom are secured with prutyk. In English this is called 'ladder hemstitch'. There are many elaborations on this technique which i will not be addressing in this article. 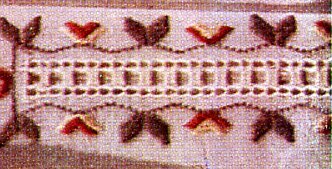 Sometimes a second thread or group of two or three threads is pulled parallel to the first, with two or three threads left undisturbed in between. Then both can be worked at the same time, as here. 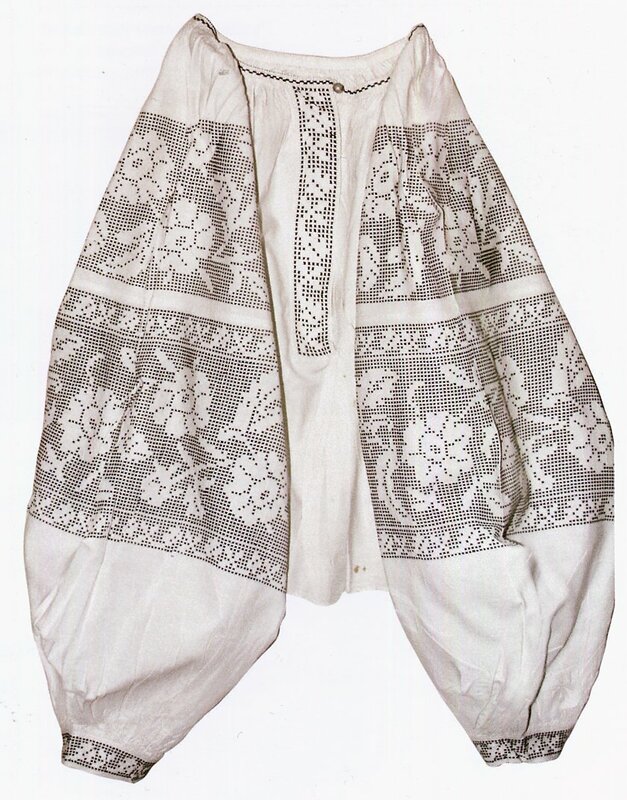 Ukrainians call this 'double prutyk'. 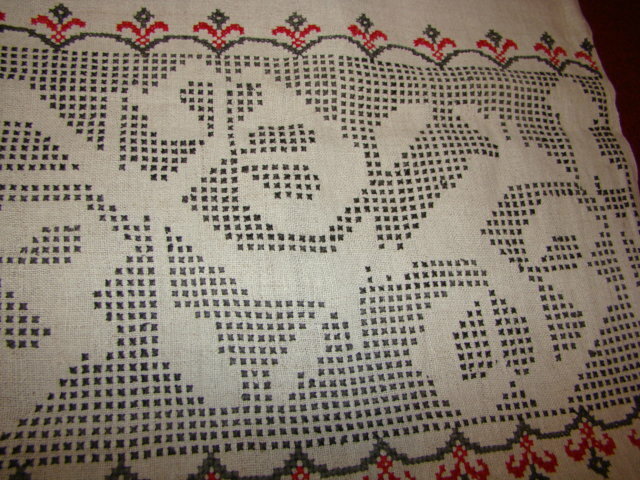 This is also used as a design element as is. 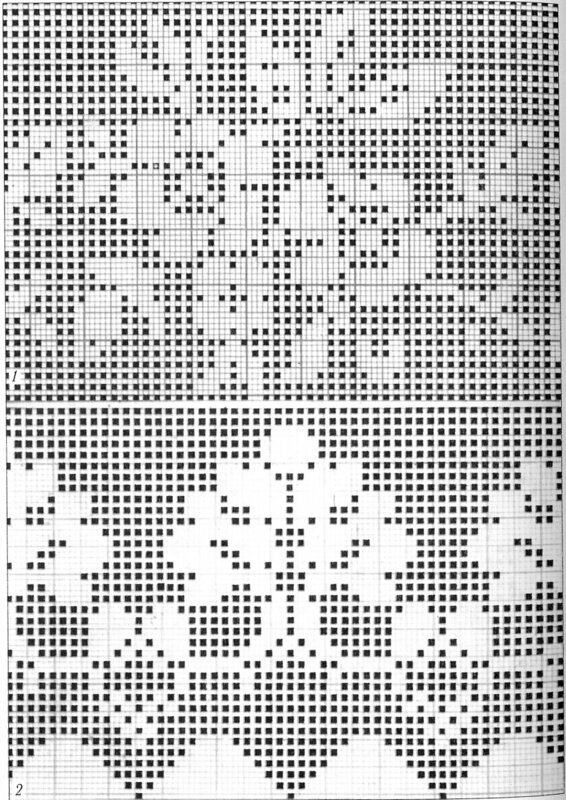 Now each of the squares made by this technique can be thought of as a pixel. If you have contrasting pixels, then you can build them up into a design. In Ukrainian embroidery this is achieved by what are called 'layerings', in which the white thread is wrapped around two or more adjacent posts to form a closed pixel which contrasts with the open ones. The simplest such design is called 'posts', in which one open pixel alternates with one closed pixel. This is also a common design element. 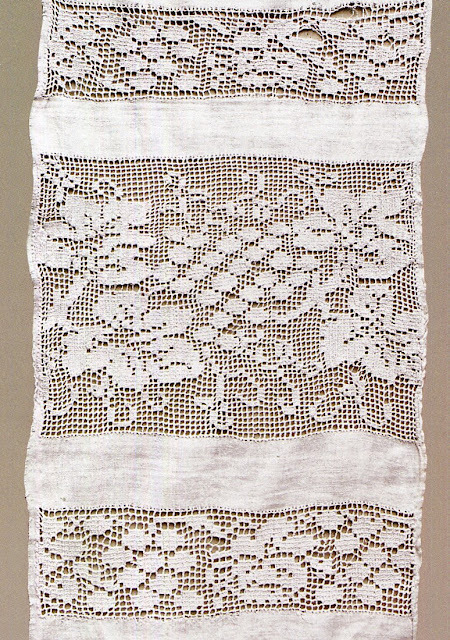 It is most often framed with a row of prutyk on either side. This presents us with great possibilities. 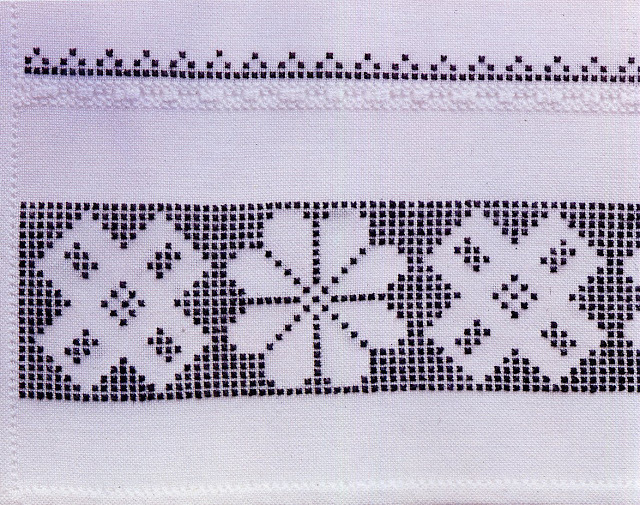 A design can be built up by working successive rows of prutyk hemstitch, with some pixels left open and others closed by layerings. 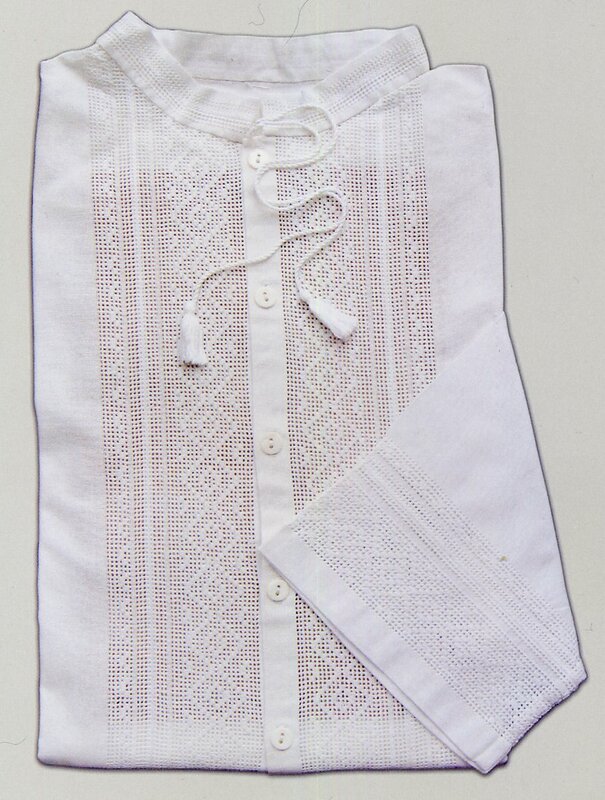 Here is an example from a woman's chemise in my personal collection. This is worked above the bottom hem. This is worked row by row. 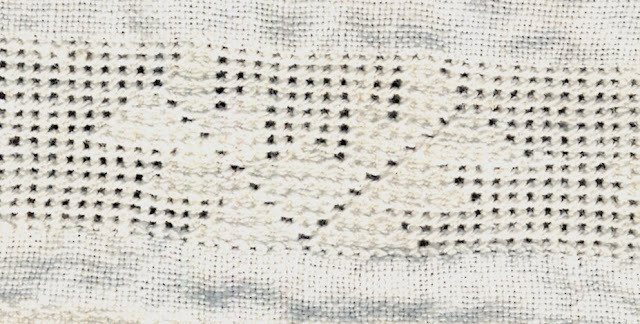 When you have a number of closed pixels in a row, the layering is worked over all of them together, just like the single pixel, each wrapping of thread going around all of them, and being secured in the same way as a single pixel. another example. This can be used by itself to build quite large designs. The design at the top of this article is from a rushnyk [ritual towel]. Here is an image of the whole piece. 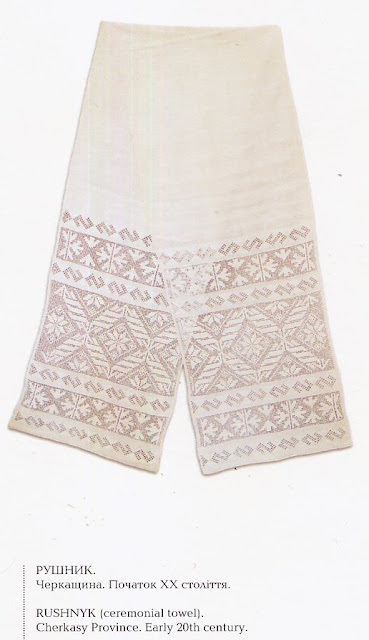 While this technique is called 'Poltavksa Merezhka', it is not limited to the Poltava region. 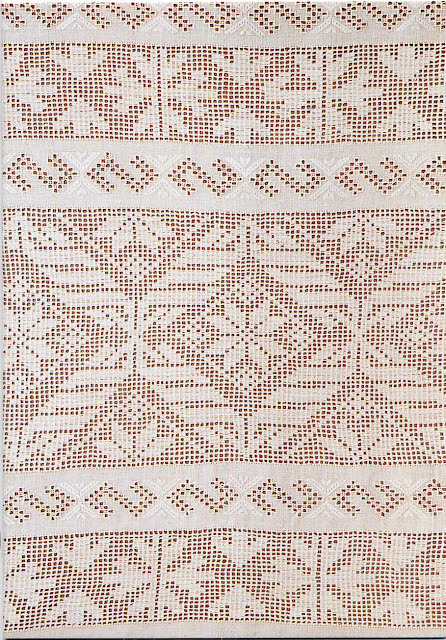 White on white and openwork techniques, including this one are found throughout central Ukraine, in Chernihiw, Cherkassy, Kharkiw, Kyjiw [Kiev] provinces, among others. 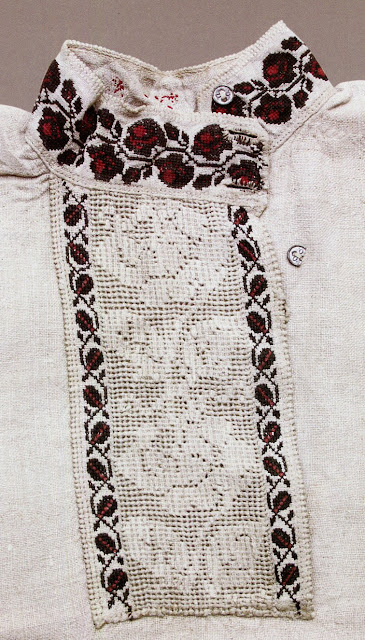 Here is another rushnyk from the Chernyhiw region. 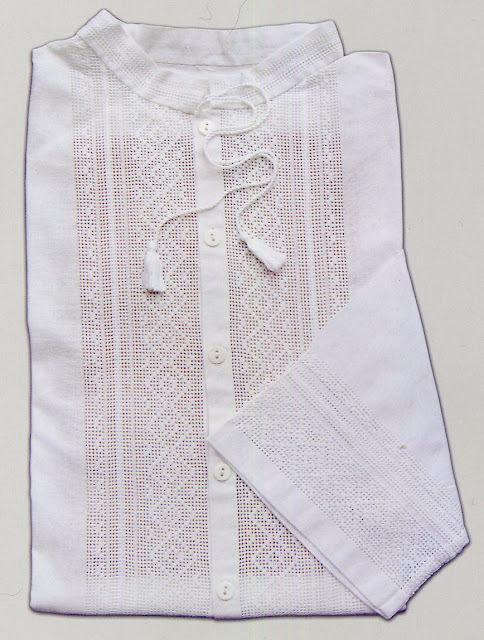 or modern women's blouses and men's shirts. 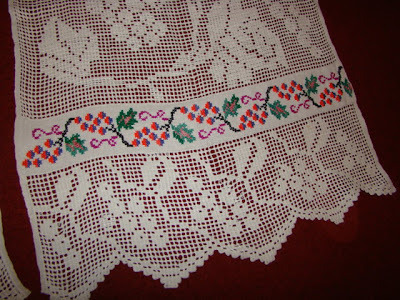 Ukrainians do not traditionally do reticello or make lace. However, this technique approaches those arts. As you can see, generally the designs used are geometric or floral. But in fact any design that can be graphed in one color may be used. 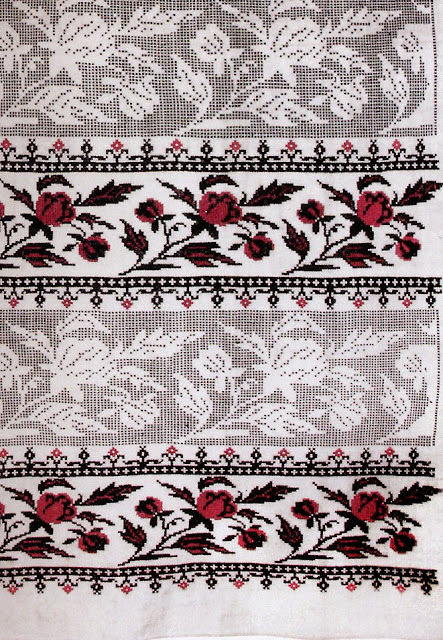 Any single color cross stitch design may be adapted for merezhka Poltavska. Here is one example of a design adapted from cross stitch. This is the simplest way of graphing a merezhka design. Here are a couple more. 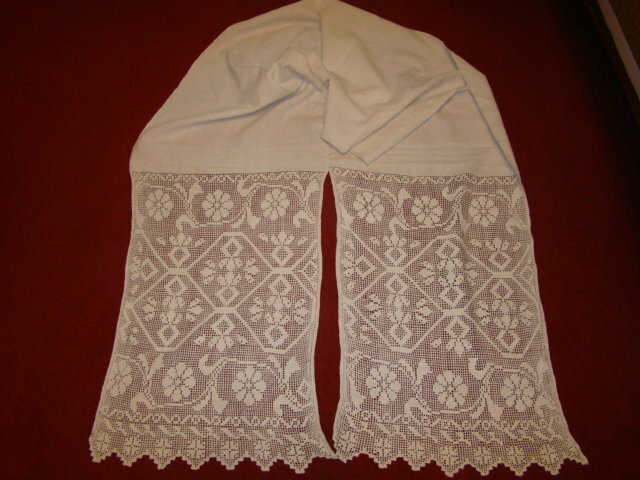 There is another embroidery technique called obmana. The word obmana means 'fakery' or 'deception'. 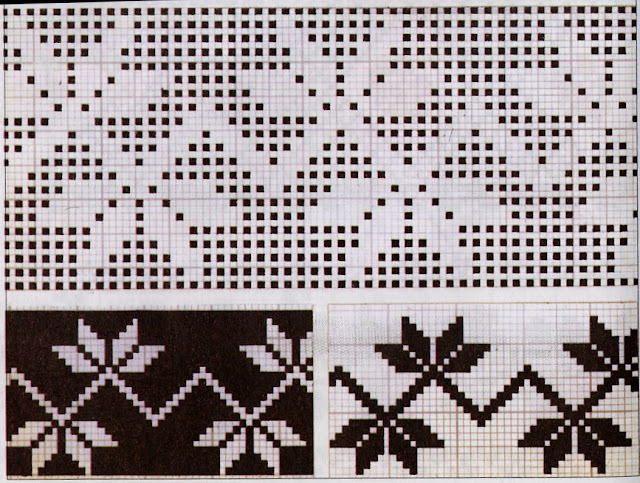 This may possibly have started as a result of the idea that open work embroidery was not suitable for women 'of a certain age', or it may simply have resulted from a desire to achieve an effect similar to merezhka with much less work, or just possibly from a misunderstanding of a graph like this one. 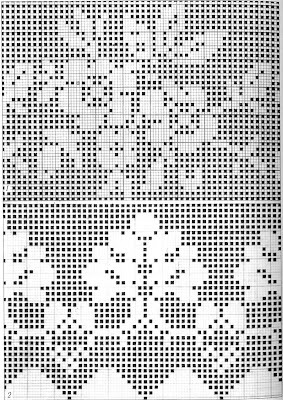 Obmana consists of working black cross stitch according to a graph like this one, leaving spaces in between each stitch. This gives the effect, from a distance, of merezhka work. Here is a woman's chemise which is worked in obmana. This would be suitable for an older woman. A close examination reveals the actual technique, but from a distance it does resemble merezhka. 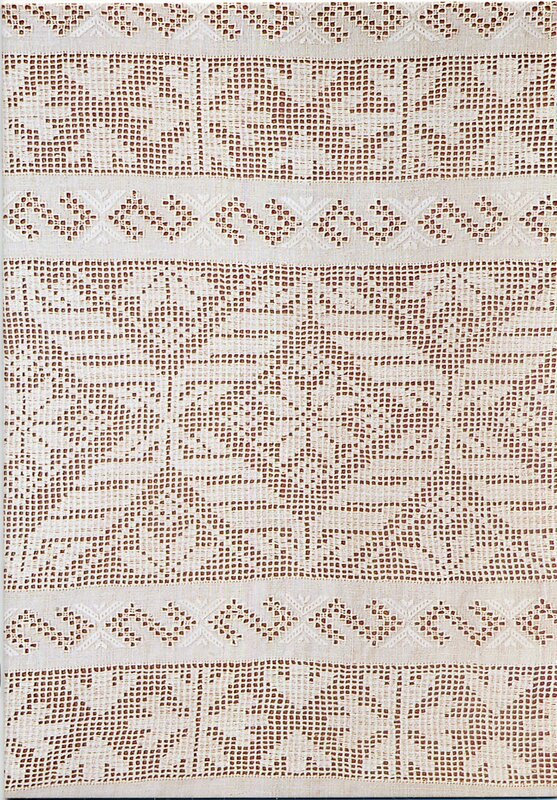 Obmana, like merezhka Poltavska is often combined with other stitches. 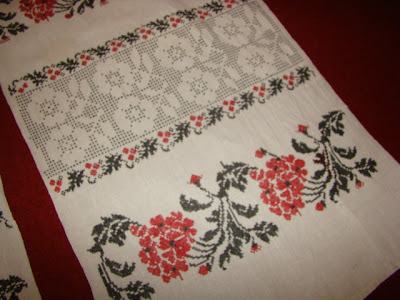 You will notice in the second example that the same design is worked in both obmana and cross stitch. Sometimes you will read that obmana is simply using cross stitch to make a negative area design, but this is not the case, obmana is only used to refer to those designs in which each stitch is separated, and recalls the openwork of merezhka. 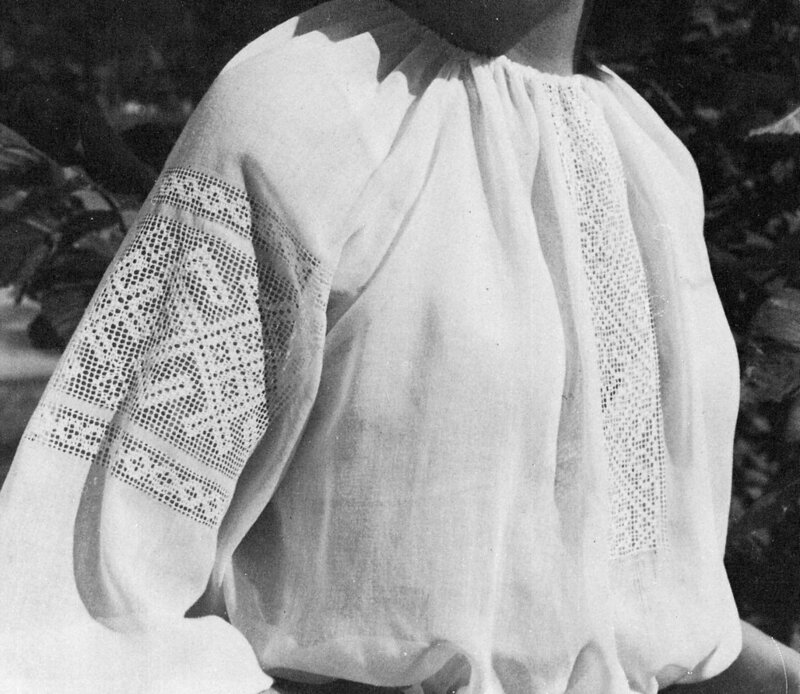 I will close with a couple more rushnyky from Cherkassy. Is it Merezhka or is it Obmana? Thank you very much for reading. I hope you have found this interesting and perhaps inspiring. 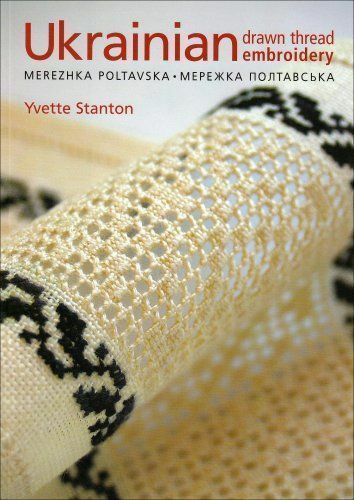 If you are looking for step-by-step instructions as to how to do Merezhka Poltavska, there is a book devoted to the subject by Yvette Stanton. She walks you through a series of projects which will help you master this technique. Цікава інформація! Дякую, пане Романе. Meni duzhe rado. Diakuju shcho vy chytajete moji Statii. a thorough and well illustrated post. very interesting. Al weer heb ik een hele lange tijd zitten kijken op U site. Prachtig al die patronen. Ik heb zelf al een paar randen getekend in de Obmana techniek. Thanks for the review,pane Romane ! Can you,please,tell me where I might find the above mentioned book to purchase ? I am also looking for the book on traditional Ukrainian beadwork/nanyzuvannia/herdany ,etc. Would appreciate any information. Shanovnyi pane Romane,duzhe Vam diakuju. 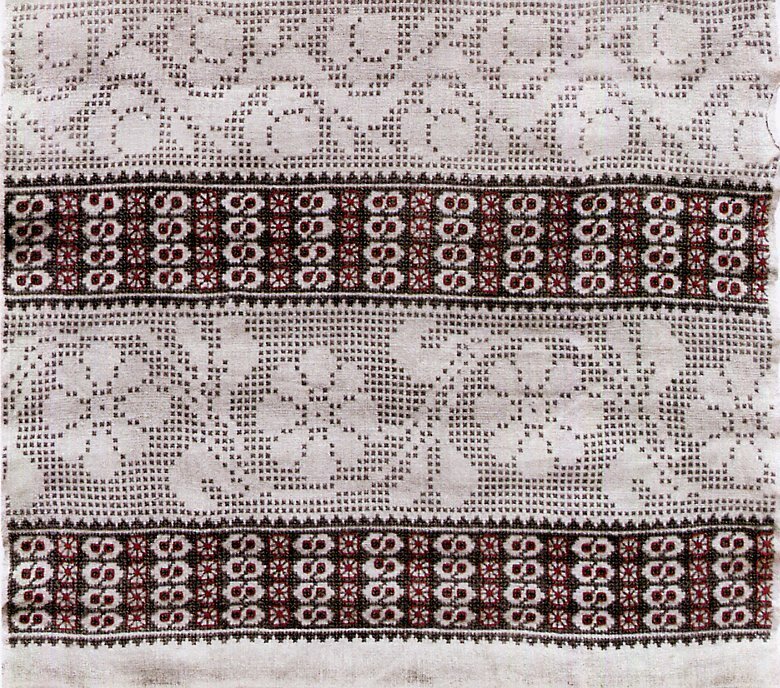 Zahopliujuchyj material. Osoblyvo zatsikavyla tehnika 'obmana',vykorystana/dubliovana poruch hrestyka,- takoho nikoly dosi ne bachyla,hoch i vyrostala v Ukrajini ta z vysyvkoju bula znajoma. Duzhe-duzhe Vam vdiachna za vsiu informatsiju: tut,na chuzhyni meni takyh knyzhok duzhe brakuje,i v Ukrajini davno ne bula.